VMware vSphere 5.5 released brought many new features in virtual networking. The details about NSX (network virtualization) will be covered in separate post as this is completely new technology. In this post we’ll just covers the enhancements and new features brought with vSphere 5.5. If you don’t know what is LACP for. LACP allows to select multiple physical NICs to form one single big “pipe”. 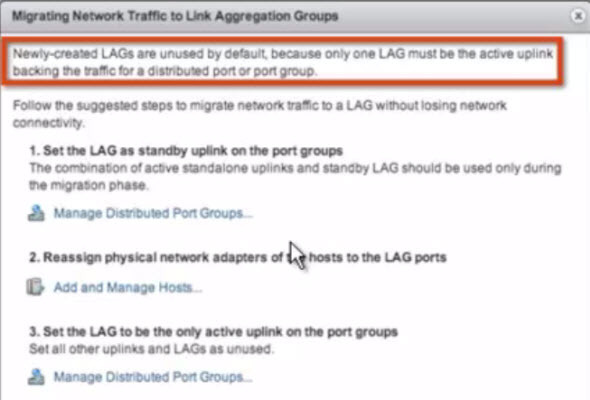 LACP Enhancements – the LACP (aggregate bandwidth) which has been introduced in vSphere 5.1 had the possibility to do single aggregation group per VDS whether this limit is lifted in vSphere 5.5. You can have multiple aggregation groups on vDS in vSphere 5.5. The exact limit is 64 aggregation groups. Also the way the traffic is balanced between links improved. In vSphere 5.1 only the IP hash was supported, where in vSphere 5.5 there is support for 22 hashing algorithms! For large environments, it’s possible to setup a template with the desired hashing algorithm and apply the template on the rest of your hosts. LACP config, where? – There is a change compared to the vSphere 5.1 also concerning where do you configure the LACP. In vSphere 5.1 the configuration has been done at the port group level, but in vSphere 5.5 it is now at the vDS level. Enhanced SR-IOV – Introduced in vSphere 5.1, it offload the IO onto the NIC. Where the work is done out of the VM kernel. 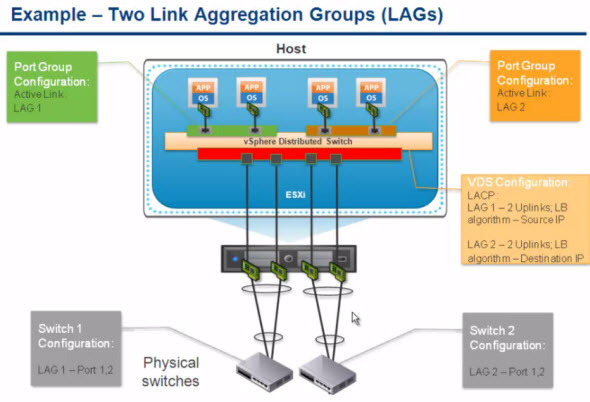 A single PCIe device is presented as multiple virtual devices to your VMs. The improvements are made at the communication between the port group properties . 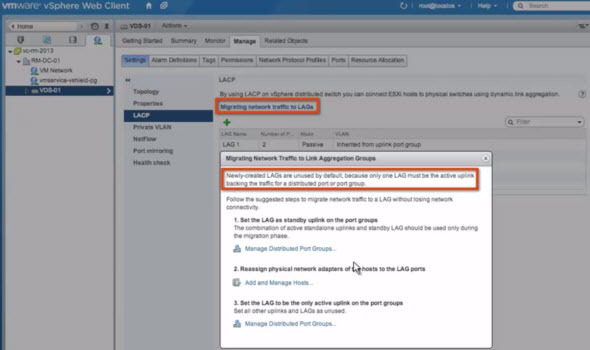 VLAN taggings settings at the port group level now communicate up to the adapter. When using SR-IOV there is no vMotion of FT usage possible. You can also have tags based on inboud/outbound. QoS Tagging – In addition to 802.1 present in previous releases, there is now a possibility to set service level agreements and prioritization. It’s L3 tagging. 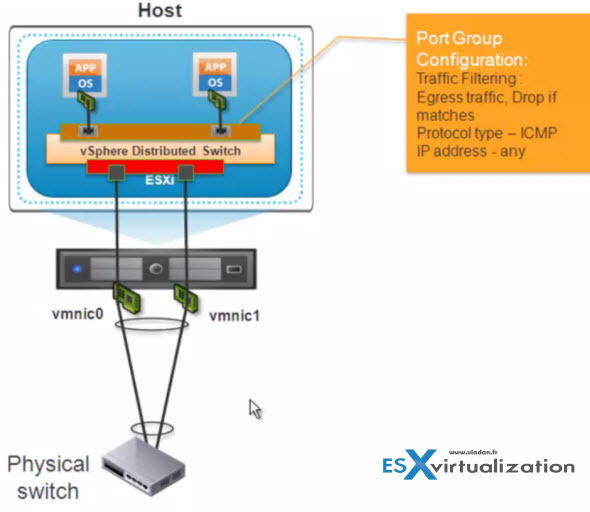 Allows allocate bandwidth, keep the tag when the frame leaves the ESXi host and enters the physical switch. In previous releases in this kind of situation, the tag was lost. Packet capture tool – there is new tool for capturing packets. It’s CLI tool, enhanced version of TCP Dump. You can track and analyse data flowing through vNics, vSwitches etc… You can also use this tool to troubleshoot issues in virtual networks. Differentiated Service Code Point Marking (DSCP). 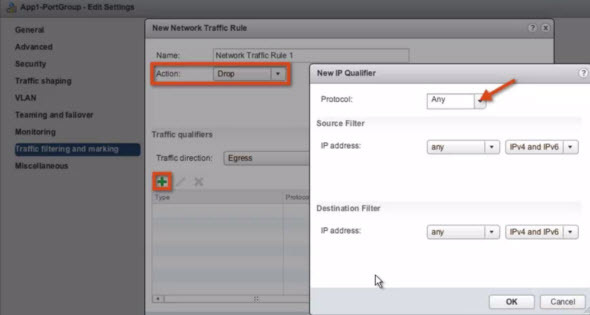 This is a new feature which allows to classify network traffic and provide QoS. As a principal advantage of this feature is that important traffic can be tagged so it doesn’t get drop in the physical network during congestion. It also allows to provide end-to-end QoS and SLA. You configure this feature at the portgroup level. The filtering rules are defined at the portgroup level and they are based on MAC SA or DA qualifier. You can use those feature if you don’t have stateful firewall and use this as a poor’s man security. You can allow or deny selected types of traffic. And on the image bellow you can see where to configure the traffic filtering feature – at the portgroup level.